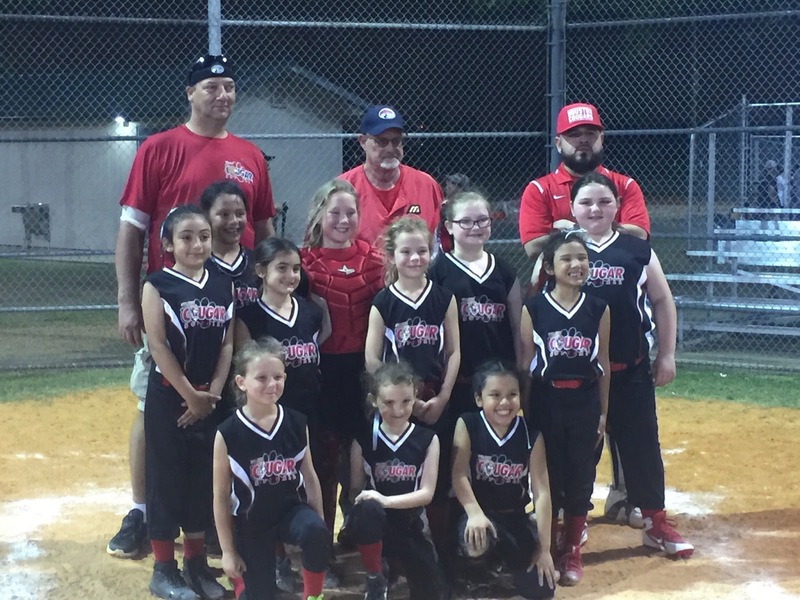 DEER PARK, TEXAS (March 26, 2018) Paced by four RBI by catcher Kirstin Kelly, the Deer Park Cougars 8U softball team (shown right) downed the Deer Park Savage by the score of 10-8 in Girls League action at the Adult Softball Complex in Deer Park. The Cougars kicked of their scoring assault when Kelly singled in the second inning; sending shortstop Aubrey Rogers and rover Jocelynn Wall home from second and first base, respectively. Kelly added two more RBI in the third inning on another single, bringing second baseman Emilee Mendoza and Rogers home. Rogers tallied three hits in the game, including the final hit of the game to give the Cougars the win. Left fielder Quinn Romero connected for two hits, along with right fielder Paige Taylor and third baseman Melina Delgado for six of the Cougars' 17 hits. First baseman Riley Wilson was 2-for-2 at the plate (single, double) and scored two runs. Next up for the Cougars is a Thursday, March 29 match-up against the Deer Park Cobras. First pitch is set for 6:15 p.m. CDT at the Adult Softball Complex in Deer Park. The Cougars are managed by Larry King, and coached by Able Mendoza and Dale Yurt. DALLAS, TEXAS (March 15, 2018) The No. 3 Texas Tech Red Raiders (25-9) started the game slowly, but came back to life in the final five minutes of the game to down the No. 14 Stephen F. Austin Lumberjacks (28-7) by the score of 70-60 in the first round game for both schools at the 2018 NCAA Division I Men's Basketball Tournament in Dallas. The near capacity crowd at the America Airlines Center saw the Lumberjacks control most of the game, but falter down the stretch. The Red Raiders trailed most of the game, but pulled ahead with 3:59 left in the game with a layup by Keenan Evans (Richardson, Texas). The two points pushed Tech into the lead 59-58 as they went on to outscore the Lumberjacks 11-2 in the final minutes of the game. Texas Tech shot a paltry 35% (10-of-28) from the field in the first half, allowing SFA to take a 30-27 lead at half time. They improved their shooting percentage to 57% (15-of-26) in the second half while the Lumberjacks, who shot 37% (9-of-24) in the first half did not improve their shooting (9-of 23, 39%) in the second half. Evans tallied 23 points for the Red Raiders while fellow guard Zhaire Evans added 10. SFA had four players in double figures, with Ivan Canete (Lake Worth, Florida) leading the way with 17. Texas Tech head coach Chris Beard discussed his thoughts after the game with the press. "First of all, I just want to congratulate Stephen F. Austin for a great season. They were everything we thought they would be and more. Kyle Keller is a great coach. They've got good players. They've got a program is what they have. You go back to Danny Kaspar and certainly Brad Underwood, and now Kyle has taken it to another level. They just forced us into so many things and took away things, but I just wanted to congratulate them on a good season, and I know Kyle is just getting started building the program there. For our guys, we knew we were going to have to play great to win this game because we knew how good Stephen F. Austin was. I'm really pleased for our players that we advanced to the second round, beating a team that we had nothing but respect for." SFA head coach Kyle Keller also talked with the press after the game. "I wish we could have ended the game at halftime, obviously, but the game is 40 minutes. I give Texas Tech a tremendous amount of credit. 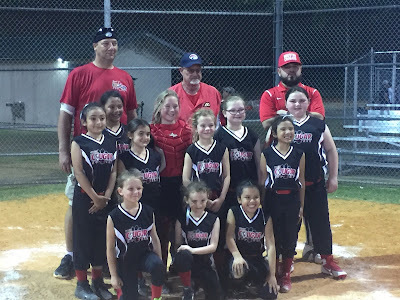 Their Coach Chris Beard, his team embodies his spirit and toughness. And they imposed their will obviously the last 10 minutes or so of the game, and my guys tried. They always try, but we just didn't have enough tonight. We just -- it wasn't our night." Next up for the Red Raiders will be a Saturday, March 17 meeting with the winner of Florida vs. St Bonaventure. The Gators come into the tournament as the No. 6 seed and a 20-12 record. The Bonnies counter with a 26-7 record and the No. 11 seed. DALLAS, TEXAS (March 15, 2018) With 3/10 of a second to go in the game, starting forward Donte Ingram connected from three-point range to give No. 11 Loyola Chicago a 62-60 win over No. 8 Miami (Fla.) in the second game of the first round of the NCAA Division I Men's Basketball Tournament at American Airlines Center in Dallas, Texas. With neither team able to gain an advantage after 20 minutes of play and the score tied at 28, both teams came onto the court for the second half and that told the story of the game. Both teams shot 50% or better in the first half; (Loyola 52%, Miami 50%), however the difference in the game came down to the second half. Miami led in almost every stat, but the final three-pointer by Ingram made the difference and sent the Ramblers to the second round. Both teams led by seven points at different times in the game; Loyola at the 14:02 mark in the first half and Miami with 15:40 left in the game. Coming down the stretch, the Hurricanes were never behind until Ingram's three-pointer. With nine seconds left in the game, starting guard Ben Richardson rebounded a missed free throw by Miami's Lonnie Walker IV. After bring the ball down the court, Marquis Townes receive the ball and quickly fed it to Townes for the score. It was Townes second credited assist of the game. "You know, first of all, God is good. He blessed this group. We give the glory to him. He blessed our University, this group. 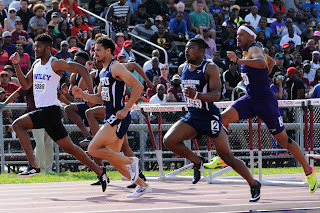 He blessed me being able to coach resilient kids. The second thing with these young guys, we're in the huddle. Even when we were down seven, it was just about keep fighting, keep fighting. There's no quit in these guys. They believe. They share the ball. We had 19 assists. And a great example is that last pass to Donte with Marques to find it. They made big shots. Clay made a big shot on an action we run in the corner. Very, very blessed that we have kids that do not quit, that are resilient." The Rambles had four players in double figures, with Clayton Custer leading the was with 14, Ingram followed with 13, while Aundre Jackson and Cameron Krutwig coming off the bench to contribute 12 and 11, respectively. Miami had four players scoring in double figures, led by Walker IV with 12. Loyola will next face No. 3 Tennessee on Saturday, March 17. The Volunteers downed Wright State 73-47 earlier in the day. DALLAS, TEXAS (March 15, 2018) After failing to score in the first three minutes of the game, the No. 3 Tennessee Volunteers took a 34-23 lead into halftime and went on to down the No. 14 Wright State Raiders by the score of 73-47 at American Airlines Center in Dallas. The Raiders showed little offense offense after the first few minutes of the game, shooting 31% from the field and 19% from three-point range. It was a distinct difference from the regulars season, where they shot 43% and average more than 72 points a game. Lamonte Turner came off the bench and scored 19 points for the Volunteers and head coach Rick Barnes. The 61- sophomore guard from Florence, Alabama was 9-of-10 from the free-throw line and hit two three-pointers. Starting guard Admiral Schofield (Zion, Illinois) tallied 15 points and 12 rebounds, 10 of them on defense, for his fourth double-double of the season. Grant Williams (Charlotte, North Carolina) added 14 in the winning effort. "Obviously we're happy with the win and the fact that we felt coming in that Wright State would be as difficult a team that we've played all year in terms of the way they move without the ball. They're really a team that, you watching them on tape, you could tell they were just a terrific team. They understood each other. They've had one of those special years, a lot like we have. So from that point, defensively we were really pretty good today against a team that's not a very easy team to guard. Offensively once we settled in, we settled in, and we missed some easy ones early, but we settled in and got our offense going." Wright State heads home to Dayton, Ohio with a 25-10 record while Tennessee moves on to face the winner of No. 11 Loyola Chicago and No. 8 Miami on Saturday, March 17. The tip-off time yet to be determined. 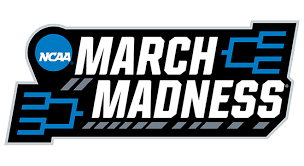 DALLAS, TEXAS (March 14, 2018) As I have done for the past five years, I am posting my picks for each round of the 2018 NCAA Division I Men's Basketball Tournament, right up to the final game. I will be listing the first-round games in four posts. The fourth post will be the midwest bracket. My picks are underlined. DALLAS, TEXAS (March 14, 2018) As I have done for the past five years, I am posting my picks for each round of the 2018 NCAA Division I Men's Basketball Tournament, right up to the final game. I will be listing the first-round games in four posts. The second post will be the east bracket. My picks are underlined. 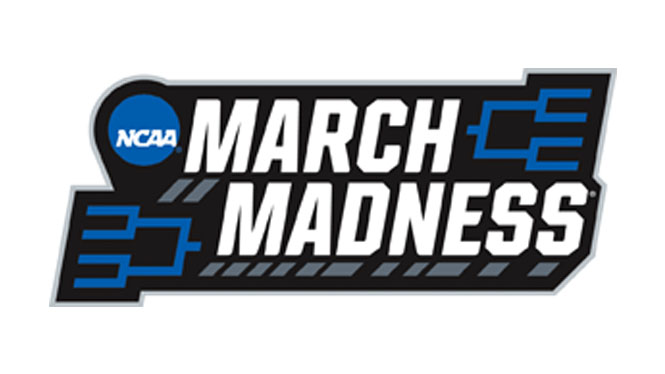 DALLAS, TEXAS (March 14, 2018) As I have done for the past five years, I am posting my picks for each round of the 2018 NCAA Division I Men's Basketball Tournament, right up to the final game. I will be listing the first-round games in four posts. The second post will be the west bracket. My picks are underlined. 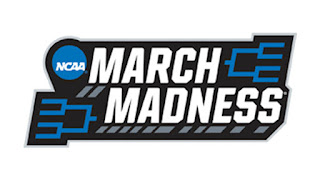 DALLAS, TEXAS (March 14, 2018) As I have done for the past five years, I am posting my picks for each round of the 2018 NCAA Division I Men's Basketball Tournament, right up to the final two game. I will be listing the first-round games in four posts. The first post will be the south bracket. My picks are underlined. DAYTON, OHIO (March 14, 2018) The No. 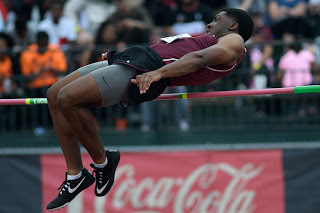 16 Texas Southern Tigers (16-19) defeated No. 16 North Carolina-Central Eagles (19-16) by the score of 64-46 in the third game of the "First Four" of the 2018 NCAA Division I Men's Basketball Championships. 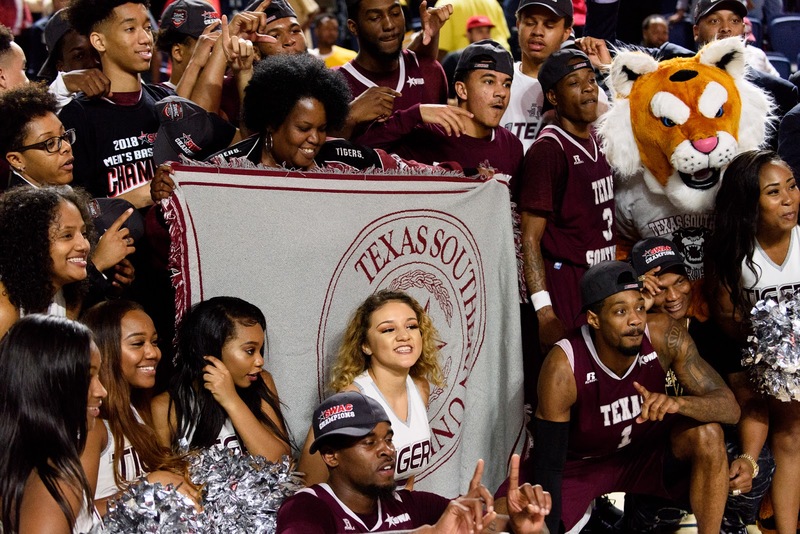 The win was the first-ever NCAA tournament win for Texas Southern. The Tigers now advance to the Round of 64 to face the No. 1 Xavier Musketeers (28-5). They will play Friday, March 16 inside Bridgestone Arena ion Nashville, Tennessee. 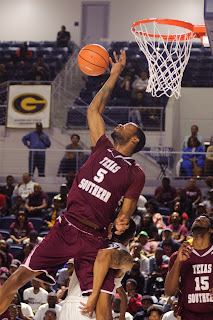 Demontrae Jefferson (number 3, shown above), who was selected the Most Valuable Player of the SWAC Tournament this past weekend, scored 25 points in the Tigers' victory; shooting 8-of-18 and pulled eight rebounds. DAYTON, TEXAS (March 13, 2018) With two of the "First Four" games of the 2018 NCAA Division 1 Men's Basketball Tournament completed, two teams will advance to the round of 64 with two more to be determined on Wednesday, March 14. The No. 16 Radford Highlanders (23-12) downed the No. 16 LIU Brooklyn Blackbirds (18-17) by the score of 71-61 at the University of Dayton Arena in Dayton, Ohio. With the win, the Highlanders head to Pittsburgh to face No. 1 Villanova (30-4) at PPG Paints Arena on Thursday, Match 15. In the second game of the evening, No. 11 St. Bonaventure came back down the stretch to beat No. 11 UCLA, 65-58. The Bonnies will take on No. 6 Florida at American Airlines Arena in Dallas on Thursday. PASADENA-DEER PARK, TEXAS (March 13, 2018) The 2018 NCAA Division 1 Men's Basketball Tournament will begin momentarily. The games are listed below with my picks underlined. 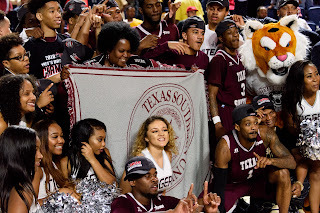 HOUSTON, TEXAS (March 11, 2018) Texas Southern University Tigers faced off against The University of Arkansas-Pine Bluff Golden Lions Saturday for the SWAC Men’s basketball championship. 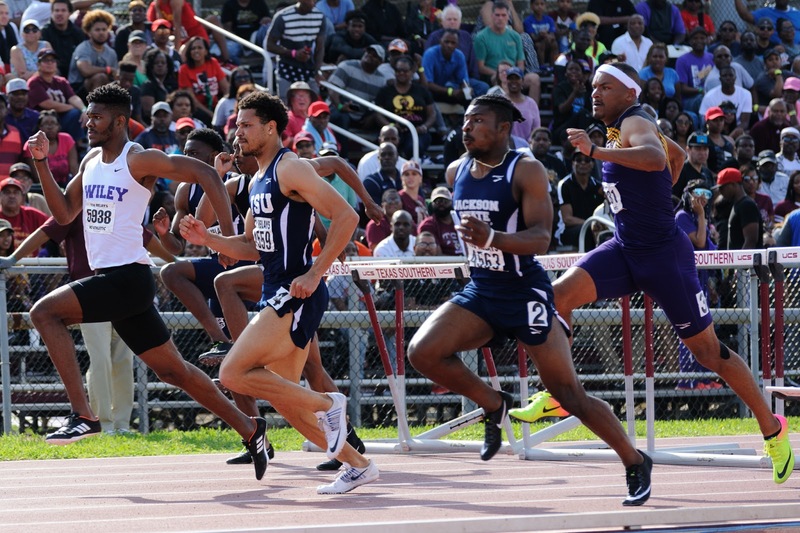 The Tigers came out strong and in control and even when The Lions appeared to be coming back, TSU shut them down and came away on top winning the title for the second year in a row. They are now headed back to the NCAA tournament for their fourth time in five years and are the first team to start 0-13 and make the NCAA tournament. 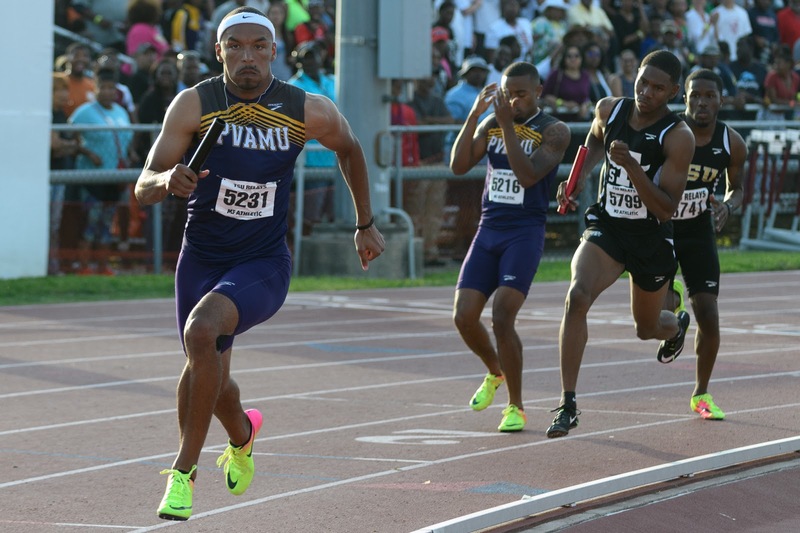 The team has battled through countless suspensions of multiple players, as well as losing the SWAC Player of Year from last season in Zach Lofton, who transferred to New Mexico State. The Tigers started out the game like they were the No. 1 seed in the SWAC tournament, jumping out to a quick 13-point lead with 10 minutes left in the first half. 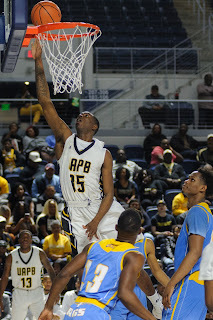 The SWAC All-Tournament Player Donte Clark had 11 of them and finished with 14 points. The Golden Lions pulled within 4 points with about 4 minutes left in the first half but TSU refused to let UAPB get a strong hold and the half ended with the Tigers owning a 45-36 lead. In the second half, Arkansas-Pine Bluff came out motivated and pulled to within two as Texas Southern started to make little mistakes. They let off the gas, gave up several turnovers and then Donte Clark fouled out for the second game in a row. However, as Clark stepped off Lamont Walker stepped up keeping the Tigers’ heads in the game. Luckily or blessed, depending on who you ask, Walker had just come back on their last road trip after being suspended. The senior was motivated to make a difference, as was the SWAC tournament Most Valuable Player Demontrae Jefferson who finished with 15 points with 7 assists and 6 rebounds, Trayvon Reed who had a double-double with 17 points and 10 rebounds and Derrick Bruce who pitched in 13 points, including four 3-pointers. 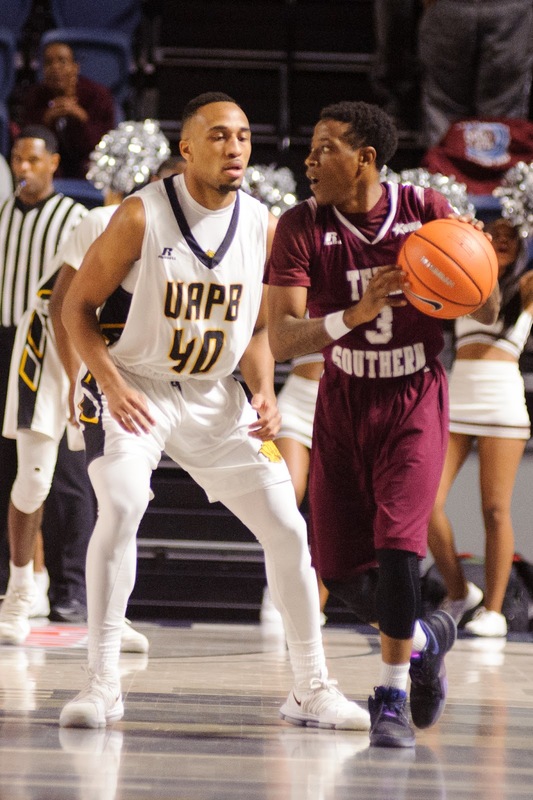 The game ended 84-69, and while it was the first time this season that TSU had managed to beat UAPB, getting swept by them during the regular season, this was the game that mattered most and bought them a ticket to the “big show”. KATY, TEXAS (March 10, 2018) The No. 4 Nicholls Colonels, paced by Cassidy Barrios' 27 points, upset the No. 1 seeded Lamar Cardinals by the score of 74-68 in the first semifinal game of the 2018 Southland Conference women's basketball tournament at the Merrell Center in Katy, Texas. The starting guard, who played her high school ball at Vanderbilt Catholic in Raceland, Louisiana, played the entire game and was 10-of-15 from the floor and 5-of-7 from three-point range. Fellow guards Tia Charles and Tykeria Williams each added 17 points to the Colonels' scoring assault. The Cardinals led 38-30 at the half, however Nicholls outscored Lamar 27-9 in the third period to quickly take command of the game and advance to the tournament final on Sunday, March 11 with a 12 noon CT start. Moe Kinard was the high scorer for Lamar with 21 points, followed by Baileigh O'Dell, who came off the bench, to score 18. Kiandra Bowers tallied 14 points, along with 18 rebounds, to achieve her tenth double-double of the season. The Cardinals end their season with a 22-7 record. Nicholls will face the winner of the Stephen F. Austin vs. Central Arkansas match-up. 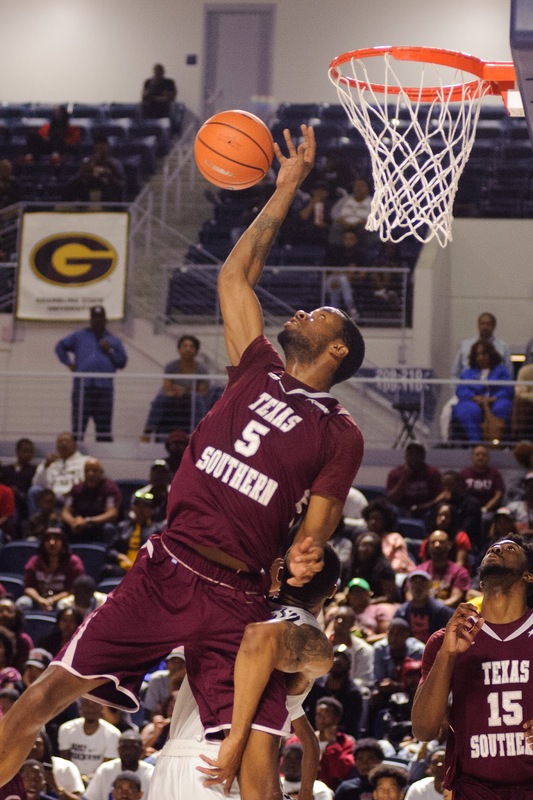 HOUSTON, TEXAS (March 10, 2018) The Texas Southern University men’s basketball team did what their female counterparts could not by defeating the Prairie View A&M Panthers in the late-night men’s semifinal action, 88-74. 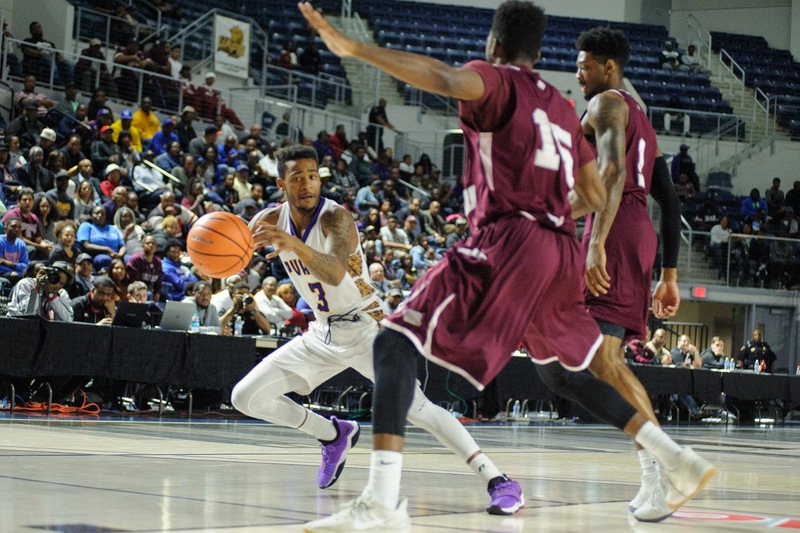 TSU threw a balanced scoring attack at the Panthers as Donte Clark led the charge with 22 points, five rebounds and five assists before fouling off late in the game. Derrick Bruce scored 18 points to go with five rebounds and three assists. Demontrae Jefferson scored 15 points and handed out six assists while Lamont Walker came off the bench and did not miss a shot, making all four from the field, including a trio of 3-pointers and two free throws to finish with 13 points. The Panthers tried to keep it close, a good effort by Blackston, who scored 32 points with eight rebounds and J.D. Wallace contributed with a double-double with 13 points and 12 rebounds two steals and two blocks, but it proved not to be enough. The Tigers went on a key 21-9 run over a five-and-a half minute span during the second half to gain an arm’s length lead. The game-altering run was sparked by a Bruce 3-pointer & layup and followed with a jumper and a pair of free throws by Clark. The Tigers continued their push with on a 3-pointer from Walker to make it a 60-51 lead with 10:45 remaining in the second half. Texas Southern avenged the two regular season losses in head-to-head match ups with the Panthers. Texas Southern shot 48 percent from the floor including 67 percent after the break while Prairie View A&M was only 39 percent for the entire game. 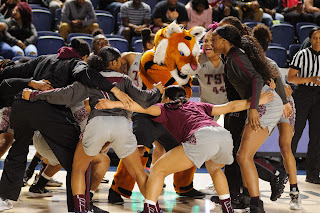 TSU advances to face Arkansas-Pine Bluff in the SWAC Championship. The Tigers face a tough opponent in the top-seeded Golden Lions who were awarded Player of the year, defensive player of the year and Newcomer honors. However never count TSU out, it isn’t over till the final whistle blows. HOUSTON, TEXAS (March 9, 2018) Behind Player of the Year Martaveous McKnight, Arkansas-Pine Bluff eased past Southern 71-65, punching its ticket to the 2018 Toyota Southwestern Athletic Conference Men’s Basketball Tournament final. A nip-and-tuck contest initially, Arkansas-Pine Bluff (14-19) managed to distance itself thanks to McKnight, who scored nine points in the first 13 minutes and knocked down a three-pointer to push the Golden Lions ahead 19-11 with 7:18 left in the half. 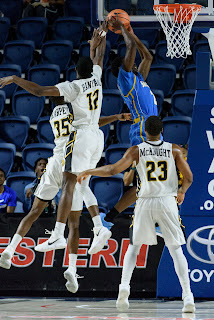 Southern responded with a 11-2 run to take a 22-21 lead with four minutes left in the half, and Eddie Reese later keyed an 8-0 run – coupled with an UAPB scoring drought that lasted more than three minutes – to take a 30-23 advantage in the waning seconds of the half. However, Charles Jackson drew a foul on a three-point try with 0.7 seconds left, later converting all three from the stripe to cut Southern’s lead to 30-27 at the break. Jared Sam asserted himself following intermission, as he accounted for five early points as the Jaguars pushed their lead to seven. After that, however, the Jaguars struggled to find the bottom of the net, slogging through a 3:03 drought without a field goal. Meanwhile, the Golden Lions responded through their big man Trent Steen, as he nailed consecutive jumpers to bring UAPB within one. Travon Harper later split a pair of free throws to tie the game at 38 with 14:47 left. Seconds later, a McKnight bucket pushed the Golden Lions ahead 40-39, but Chris Thomas dropped in a floater to put Southern back in front. Arkansas-Pine Bluff remained in striking distance throughout the second half, and Harper later scored on a put-back of a McKnight miss to tie it at 55 with 5:42 left, and McKnight later swiped an errant pass, going coast-to-coast for a lay-up that gave UAPB a 57-55 lead with just under five minutes left. 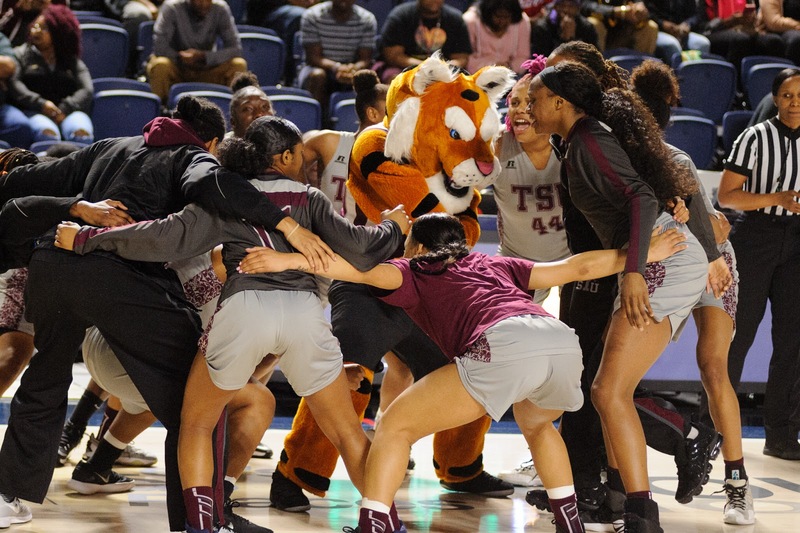 HOUSTON, TEXAS (June 9, 2018) Without Player of the Year Joyce Kennerson, the Texas Southern University Lady Tigers basketball team fell to Grambling State dashing their hopes of a repeat title on Friday in the SWAC championship semifinals. 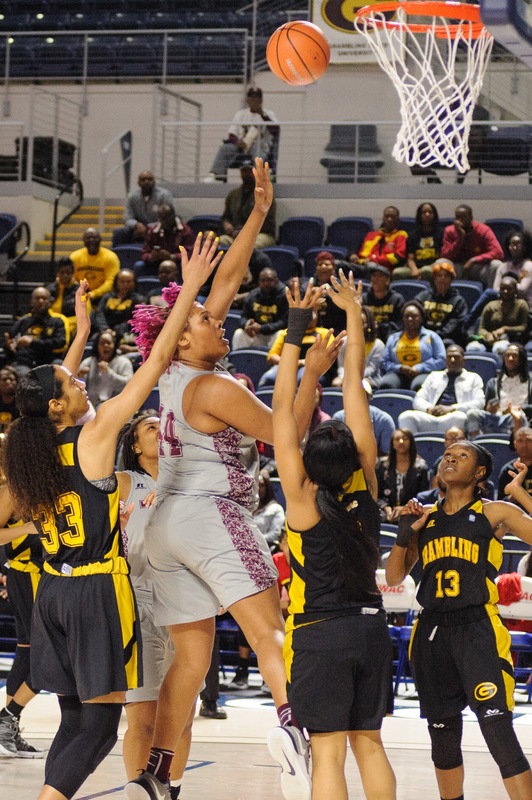 The Grambling State Lady Tigers avenged last year’s tournament final loss, defeating the defending champions Texas Southern 66-59 to advance to the 2018 SWAC Women’s Basketball Tournament championship game. The Tiger’s had a rough first half which culminated into in-fighting and insults being hurled at each other and subsequently having to face the wrath of their Coach Johnetta Hayes-Perry whom it seemed had simultaneously gotten the in check and lit a fire under their backsides. They took the lead and were playing strong, even taking a lead into half time, but by the third quarter Grambling had all the momentum taking back the lead and TSU just couldn’t bounce back. The MVT, Most Valuable Tiger, was the Pink haired warrior number 44 Taylor Robinson who had 8 rebounds and a game leading 17 points in 20 minutes of game play followed closely behind by Kaitlyn Palmer with 16 points and 4 rebounds in 40 total minutes. Grambling’s shining star was Jasmin Boyd who put up 19 points with 4 rebounds in 26 minutes. However, their defensive monsters Shakayla Hill with 14 rebounds put up 15 points and Monisha Neal with 10 rebounds contributed 11 points. 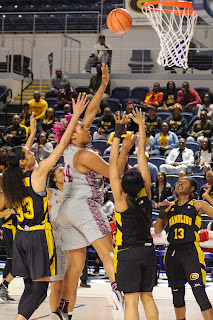 Grambling will face a tough opponent in the #1 seed Southern for the Women’s Championship, with their Defensive player of the year Briana Green and Coach of the year Sandy Pugh. KATY, TEXAS (March 8, 2018) In their first-ever Southland Conference tournament appearance, the No. 7 Abilene Christian Wildcats downed the No. 6 New Orleans Privateers by the score of 88-66 at the Merrell Center in Katy, Texas. The Wildcats dominated the second half, shooting 62% from the field while as and outscoring their Southland Conference opponent 58-37. Four wildcats scored in double-figures, combining for 72 of their 88 points. Sophomore Breanna Wright (Jarrell HS, Jarrell, Texas) led the Wildcats with 23 points, followed by sophomore Dominique Golightly (Chickasha HS, Chickasha, Okla.) with 22, senior Sierra Allen (Highland HS, Roscoe, Texas) with 16 and junior Sara Williamson (Rockwell HS, Rowlett, Texas) with 11. The game was close through the first 20 minutes. with the Wildcats holding a one point lead (30-29) at halftime. Then they kicked their offense into overdrive for a final push and a meeting with No. 3 Central Arkansas on Friday. Earlier in the season, the Bears downed Abilene Christian in two meetings. On January 20, Central Arkansas came out on top 63-45. In the second game, they also downed the Wildcats 73-61. Starting guard Randi Brown scored 18 points for New Orleans, with Shania Woods adding 10. KATY, TEXAS (March 8, 2018) The No. 5 Texas A&M-Corpus Christi Islanders jumped out to a one-point lead (18-17) after the first period and increased that lead to 37-24 at the half in route to a 75-52 win over the No. 8 McNeese State Cowgirls in the first game of the 2018 Southland Conference Women's Basketball Tournament. TAMU-CC faced McNeese earlier in the season; dropping a 70-64 decision at Burton Coliseum in Lake Charles Louisiana. The tournament win raised the Islanders record to 7-7 against the Cowgirls. The win pushed the Islanders record to 19-11 for the season and sets up a quarterfinal game against No. 4 Nicholls State on Friday, March 9. With four ladies scoring in double figures,; Brittany Mbamalu (Dulles HS, Houston, Texas) set the pace for the Islanders with 22 points, followed by Kre'Ana Henry (Moberly Area CC, Toledo, Ohio) with 16 points, with Dae Dae Evans (Bellaire HS, Bellaire, Texas) and Emma Young (East Jessamine HS, Nicholasville, Kentucky) each chipping in 10. Henry also led the Islanders with nine rebounds. For the Cowgirls, Dede Sheppard (North Caddo HS, Vivian, Louisiana) scored 20 points with Jasmyn Carswell (Airline HS, Bossier City, Louisiana) pulling down nine rebounds. Corpus Christi outscored McNeese 24-10 in the third period with the Cowgirls taking the final period 18-12. The Islanders shot 38% from the field, 35% from three-point range and 85% from the line. McNeese countered with 32% from the field, 35% from the arc and 70% from the line.